OMD made their return to the spiritual home of electronic music in support of ‘The Punishment Of Luxury’, appropriately their most KRAFTWERK sounding album ever. In 2018, OMD will be celebrating forty years in as a live entity, so it would have been reasonable to be expect them to either rest on their laurels and turn into a pub blues band. 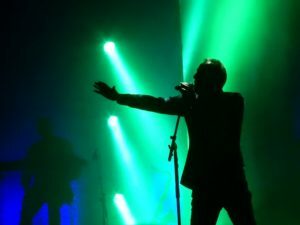 But with their new album ‘The Punishment Of Luxury’ , Andy McCluskey and Paul Humphreys’ breadth of musicality, technological curiosity and lyrical wordplay has been as strong as ever. 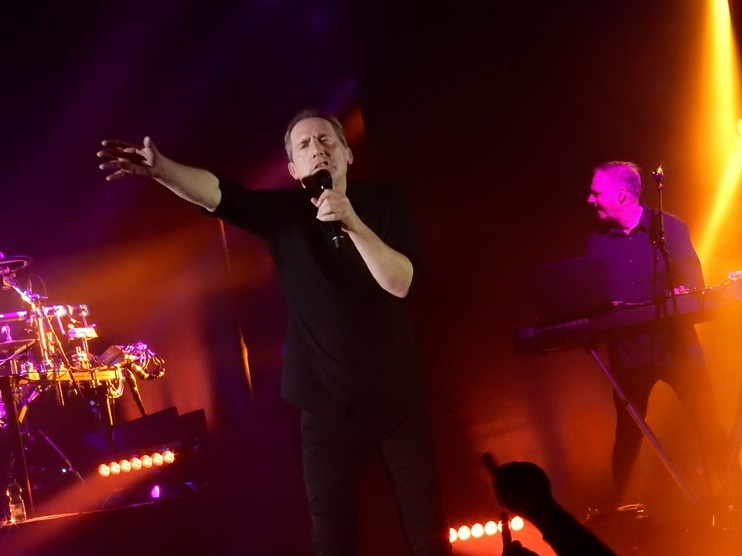 At Düsseldorf’s prestigious Mitsubishi Electric Halle, formally Der Philipshalle, the pair were accompanied by long standing keyboardist Martin Cooper and drummer Stuart Kershaw who had his first live stint with OMD in 1993. On the equipment front, Humphreys and Cooper had shifted from their trusty Roland X8 work stations to Native Instruments Komplete Kontrol keyboards, while Kershaw came armed with an acoustic looking but very electronic drum-tec kit with a Roland TD20 brain. Proceedings began in an elegant pastoral manner with ‘Ghost Star’, its VANGELIS overtones sounding epically European and easing the audience into an evening of high octane entertainment. The next five numbers were full-on electronic pop of varying vintages with the evergreen ‘Messages’ and bouncy ‘Tesla Girls’ representing the first phase of OMD, while ‘Isotype’ and ‘One More Time’ from the new album sat comfortably alongside a kaleidoscopic ‘History of Modern (Part 1)’, all under big blocks of light in the colours of the album artwork. 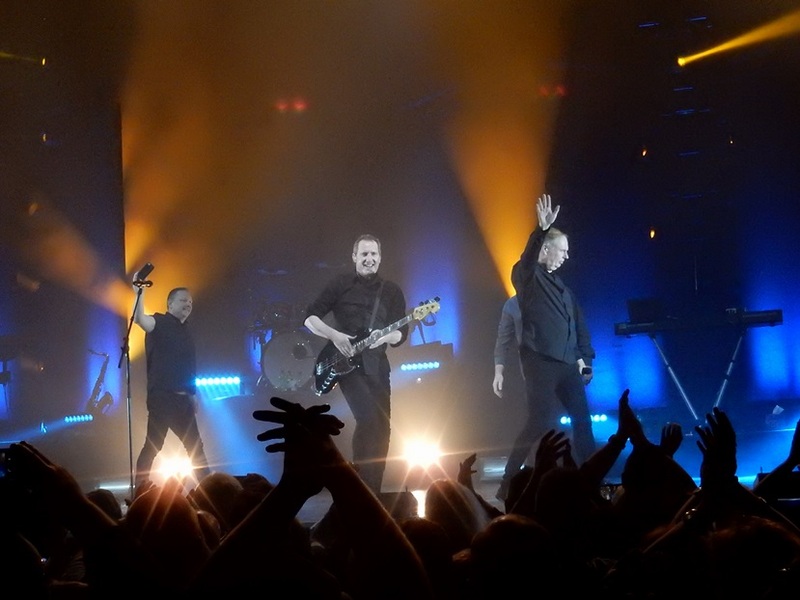 For this tour, OMD introduced a novel online vote idea where those attending could choose a song from three to be played at that evening’s performance. In the UK, this had backfired slightly as ‘If You Leave’ kept being chosen… tonight, McCluskey found time to joke about how “Merkel, Trump and Brexit” were examples of democracy gone wrong. As Paul Humphreys sang his pair of hits ‘(Forever) Live & Die’ and ‘Souvenir’, the ever energetic McCluskey didn’t go off for a lie down like DEPECHE MODE’s Dave Gahan does during Martin Gore’s piano noodling spot. He remained firmly on stage, getting behind the keyboards for the former while just being a bass guitarist for the latter. The ‘Joan Of Arc’ biopic captivated the assembled crowd, and with The ‘Maid Of Orleans’ variant being Germany’s best-selling single of 1982, McCluskey gave it his all with flinging arms akimbo to Kershaw’s militaristic rolls and a barrage of strobe lighting. And while McCluskey’s dad dancing and windmill moves may continue to polarise some observers, it is obvious that despite being several years older, he makes more effort than Gahan has done in 2017 and despite nursing a knee injury, one would be oblivious that the OMD frontman wasn’t physically 100%. 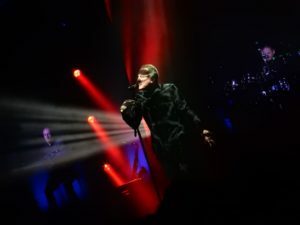 New material like ‘The Punishment Of Luxury’ title song and ‘What Have We Done’ slotted in seamlessly next to the classic OMD material, with none of the awkwardness at 21st Century DEPECHE MODE concerts when the new songs often go down like farts in a spacesuit that ultimately kill momentum. 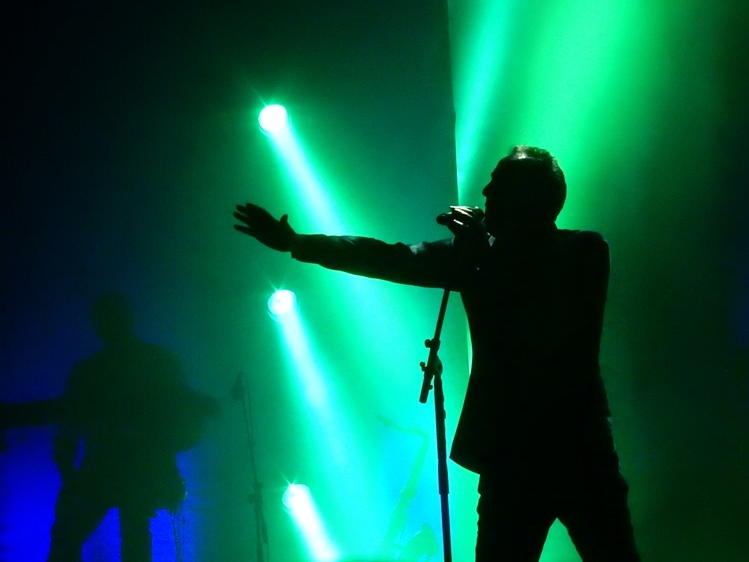 In fact on the ‘Global Spirit’ tour, there is no momentum at all until halfway through, but OMD’s show is a well-paced live presentation and even on more pedestrian tunes like ‘So In Love’ and ‘Locomotion’, McCluskey knows how to connect with the audience via his eye contact, gestures and enthusiasm. 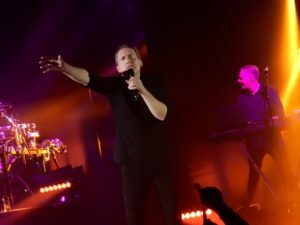 If OMD possess an arena stomper, then ‘Sailing On The Seven Seas’ is it, while ‘Enola Gay’ exuded the right balance of emotive melody and rhythmic tension. Some have complained that OMD’s music is not dark enough, but if a song about 80,000 people being burnt alive isn’t dark, then what is? Only naming a bomber after your mother to do the dirty deed, as pilot Colonel Paul Tibbets did, is darker… and as the band left the stage, the Teutonic “ZU-GA-BE” chant from the audience in perfect time with the continuing drum machine pattern was simultaneously frightening and exhilarating! 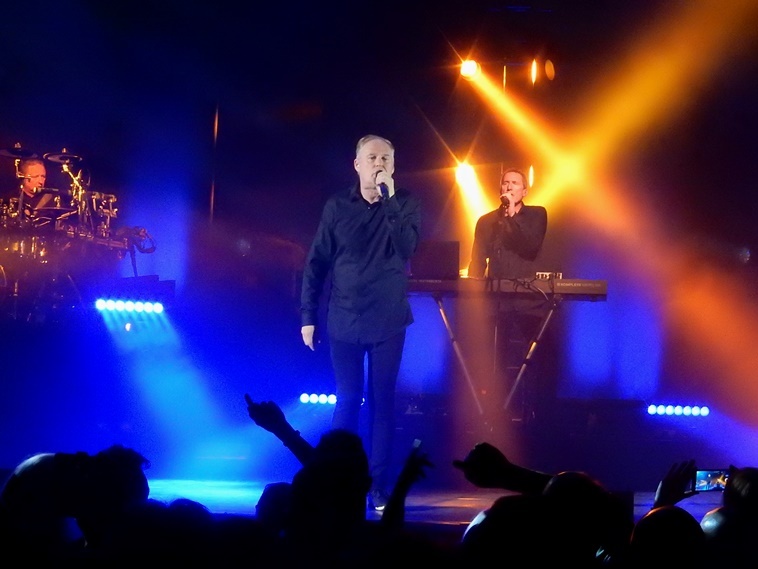 The encore provided a recital of ‘Pandora’s Box’, a hit from the solo McCluskey era of OMD which has a similar chordal structure to ‘If You Leave’. But behind the pop, there has always been an intelligent if occasionally cryptic narrative behind OMD’s songs, whether the subject is silent film stars, telephone boxes, oil refineries, evangelism, French saints, emojis, the implosion of the universe, suicide, murder, economic corruption, girls who use electrical devices, letter writing, archaeology, biological research or sustainable fuel sources! 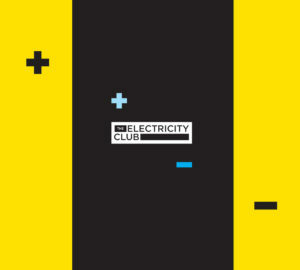 And it was with this final topic that OMD closed with the “sehr schnell” ‘Electricity’. In their 2017 tour programme, Paul Humphreys said: “As a band, we keep trying to forge ahead, pushing the band into the future, while respecting and embracing our past. This tour will be reflecting this. We are the type of band who embrace our hits, after all, we owe a 39 year career to them, they have enabled us to remain and to exist, still making records and touring the road…” – it’s a humble attitude that other acts, particularly one from Basildon, could benefit from adopting.